Glock pistols have a giant gaping hole at the back of the grip. 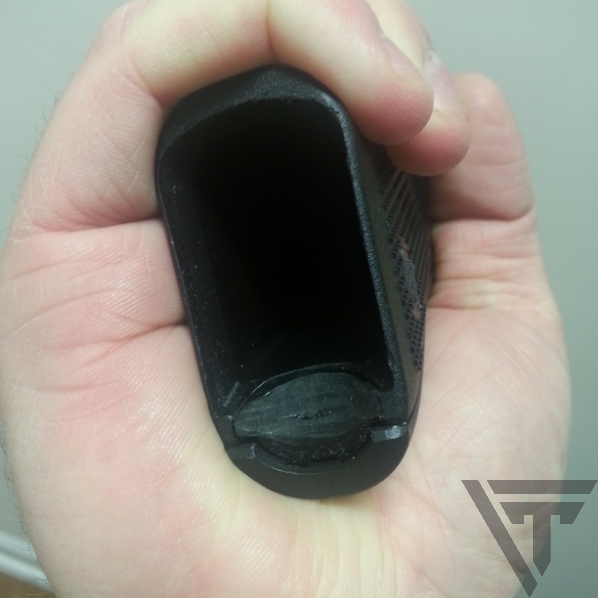 This isn’t a big deal until you start dry firing the pistol regularly, and then quickly find out that the case rim of the top round on a magazine can get caught on the piece of plastic that divides the magazine well and the hollow area at the back of the grip. A lot of folks will run a standard grip plug from any number of manufacturers to fill the gap and resolve the reload problem. I couldn’t leave well enough alone, and after looking at the grip plug, I decided that I could make it better. I took the standard Pearce grip plug that my local gunshop has for just a couple bucks, filled it with fiberglass resin to give it some extra strength, and then carefully sanded it into a funnel shape with the sanding drum on my Dremel. What I ended up with was a grip plug that not only keeps the magazine from hanging up while reloading, but it also makes a (marginally) bigger target for the incoming magazine to hit when reloading the pistol. I’ve since done this same modification to my Glock 34 competition pistol as well. I’m a real cheap SOB these days. After buying this Glock 19 I tried modifying the awful plastic factory sights by taking a set of jewelers files and very carefully filing the notch in the plastic rear sight deeper, and a little wider for a better sight picture. I then took a black paint pen to the rear sight and blacked out the big, distracting, white U shape that Glock puts on their sights. This improved the sights a bit, but they were still pretty awful. I’d been considering adding a set of Sevigny sights to this pistol for continuity with my competition gun, but I’d forgotten that while they are great sights, they come at a premium price (currently with shipping, about $85 for a steel rear sight, and F/O front). After looking around at similar options, I found some acceptable sights from Ameriglo that give me a very similar sight picture for $50 shipped (GFB-103). 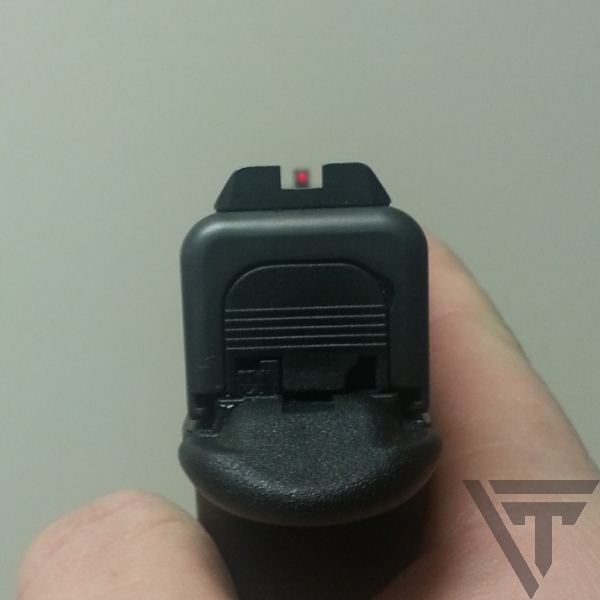 These sights are pretty simple, black rear with a square notch, and a red fiber optic front sight. 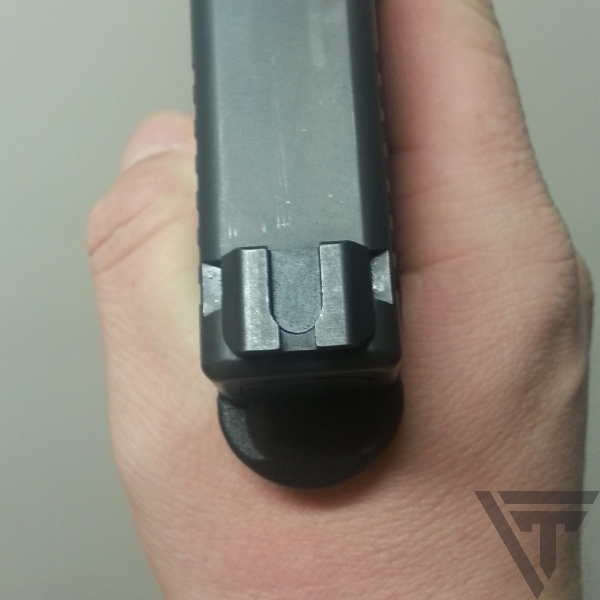 The Ameriglo rear sight moves the face of the rear sight all the way to the back of the slide which maximizes the sight radius, and it has a nice ledge on the opposite end that can be used to one handed slide manipulation, if you care about that. Those are the only two modifications I’ve made to this pistol, and they’re probably the only mods I’ll be making to it. The trigger is good enough, the sights are pretty good, and the ridge inside the magwell can’t catch my magazines anymore when reloading the pistol. Good enough. I also like to clean up and lighten the trigger just a bit on my Glocks. fwiw – I have found what I feel are the best sights around for day or night. As I get older (54), I need more light to see effectively. I have some guns with fiber optics, and they are fine during the daytime, but not very helpful at night. I have some guns with Truglo TFO sights, and they work pretty well, but would still like something even brighter. The best I have found is the Trijicon HD night sights. They have a large orange dot on the front that really stands out with a blackout rear sight, and then at night you have your 3 dots of tritium. They are pricey (around $140) but I have them all both of my regular carry guns. Worth every penny. A lot of folks like the Trijicon HDs, and I’ve run a very similar setup from Ameriglo in the past. I found that the super bright front sight washes out in the bright sunlight and makes shooting distant targets accurately very hard. I put a square of skateboard tape on the right-hand, lower bit of the grip (corresponds to the heel of my right hand). Doesn’t seem to cause any carry problems but does help get a more secure grip. Looks like this post is getting g a ton of traffic from Facebook, can anybody tell me who shared the post on Facebook so I can say thanks? Aliengear holsters shared it. That’s how I found it. On my glocks I like to run bar sto barrels, grip tape, and ameriglo sights. I had my g29 slide, trigger and other internalsworked up by Mark at L&R, best money I ever spent. I own a Glock 30 gen4. I put in the trijicon night sights, ghost competition springs, and 3.5lbs bar for a more crisp trigger pull and a faster reset, slide release extension, it made a world of a difference in the performance of my Glock. As I’ve aged, I’ve started having trouble seeing the front sight clearly. I just cant focus that close. I tried a Trijicon RMR and found that somehow that works just fine. Shooting is amazingly fast and accurate. I think slide ride optics on carry guns are definitely the future. With IDPA talking about adding a division for optic pistols, hopefully that’ll drive even more innovation in the area. Glock 30 with ghost ring sight on rear with two glow dots on it, front night sight green dot, going to have the back strap modified and trigger guard milled back so you get a better and more comfortable grip. I have a bunch of Glock’s and I run a 3.5 trigger connector, (Double Diamond) heavier trigger spring, 4# striker spring Titanium Safety block with lighter spring.Trijicon HD Nite sights or Truglo TFO’s. Extended takedown lever and a Stainless RSA. I also polish the trigger bar. I also have M&P’s an XDS and a Sig 1911. I have a bunch of holsters. Been using a Alien Gear 2.0 Cloak Tuck for a while now and love it. I usually carry a 19 or my Shield. I suggest reading what Massad Ayoob has to say about trigger mods to Glocks used for self defense. A lightened trigger pull is potentially both dangerous under emergency conditions and a courtroom liability. I’m not crazy about the feel of the G19 trigger. After half a dozen magazines, it gets almost painful to shoot. A smooth trigger like on the Sig P320 (a bigger, heavier, more expensive striker gun) would be nice, but it would negate the benefit of the trigger “safety”. Otherwise, my wife refuses to carry the G19 in its factory configuration which is without a manual safety. Mas Ayoob gave me a clue in another of his articles where he referred to the Cominolli safety for Glock, and that he likes it on his G17. Turns out, it works well and has even been adopted for retrofit by some police departments (probably after a GlockLeg event by an officer, as seen on YouTube many times.) Because my local installer wanted 8 weeks to do the install, I sent the G19 to Cominolli. Afterward, some thin cardboard, large binder clips, and a hair dryer allowed me to modify the Cooks IWB kydex holster to accommodate the gun with the Cominolli safety. BTW, the safety works well. It’s in a good spot for easy disengage, yet it has not been at risk of accidental engagement while shooting (like some 1911 safeties have been.) I carried a G19 for several years in the past. Frankly, I like it a lot better with the Cominolli safety. Final mod on any self defense carry or nightstand gun, for me at least, is night sights. The new Truglo TFX sights are an update to the TFO combination fiberoptic/tritium sights, adding a white ring around the front sight. Except for the front sight being half an inch long and therefore reducing the sight radius by that much, these are great all purpose sights. As good as my SigLite or Trijicon HD’s in the dark, the TFX’s are better than those two outdoors in the daytime. Lucas, I’ve just put these sights on my 19 as well because I too am a cheap SOB. Can you tell me, do they have more of a target poi(like where you lollipop the bullseye)? Or do you just “cut the bullseye in half”? I have yet to be able to test them, and won’t until probably this weekend. Lucas – old post i know, but i’m looking at snagging a pair of these sights to try out fiber and wondering how they held up for you, or did you end up swapping to something else? Still using them, still like them just fine.